Find out what spurs Captain America into action! 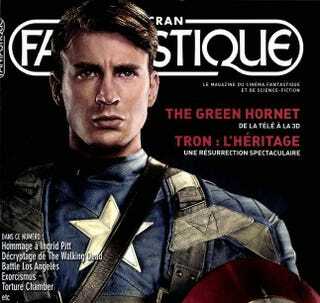 Want to know more about next summer's Captain America origin movie? A French magazine article includes enough spoilers to fill a dozen cosmic cubes. Some juicy details, including how Captain America crosses paths with the Red Skull, below. Spoilers assemble! Ninety percent of the film takes place during 1939-1945, although there is a framing story in the present day, where a gigantic bomber plane is found under the ice in the Antarctic. Then we flash back to World War II, where the Red Skull attacks a village in Norway, searching for the Cosmic Cube. The Red Skull's human face is just a mask, covering up his true skully appearance, and the Skull has left the Nazi party to co-found the evil organization Hydra, which has a secret base in the Alps, where the Skull works on tapping the secret powers of the Cube. Steve Rogers is already friends with Bucky Barnes when Steve is a puny weakling who gets bullied by thugs in Brooklyn — and the movie will use digital trickery to make Chris Evans' body look weak. After Steve takes the Super Soldier formula and becomes Captain America, he's used as a mascot in the cinema and music halls — until his old friend Bucky is captured by Hydra in a weapons factory. During his first mission, Captain America frees a group that will wind up becoming the Invaders, a World War II superhero team. Eventually, we discover just what that giant bomber buried in the ice was for. And Heinrichs hints that the second Captain America film, rather than abandoning the World War II period, might be divided between World War II and the present day, as the organization Hydra exists in both time periods.